But who does it affect? If a business exceeds the threshold in any rolling 12-month period ending at any time so it needs to be registered at 31st March 2019, it must join MTD from the beginning of its next VAT period. The business must sign up and join the scheme at least one week before their next VAT return is due. For businesses that use a tax agent such as Alexander Accountancy, the tax agent can sign the business up to the scheme. The Making Tax Digital sign up requires the agent or the business to act, it will not happen automatically. Some of the what ifs. If a business rents out commercial properties where some have an option to tax and others do not. Some rents will charge VAT where the option to tax exists, but the others, where the option to tax does not exist, will not. It is only taxable sales that count as far as the MTD threshold is concerned, and if the annual taxable sales are less than £85,000, the business does not need to join the scheme. If a business has a mixture of standard rated sales, zero-rated sales and/or sales at special rates, these all count toward the £85,000 threshold. Zero-rated or special rated sales are still taxable, albeit at a rate different to the standard rate including 0%. The business must join MTD for its first VAT period beginning on or after 1 April 2019. It is important to remember these rules apply to all organisations, not just profit-making businesses, of all designations. Where a VAT registered business record their gross takings, often due to sales being made to the general public, it is only the adjusted net sales that count toward the Making Tax Digital sales threshold. If a business has daily gross takings of £1,800 per week and the figure includes VAT – the weekly takings excluding VAT are £1,500 per week. This equates to £78,000 a year and therefore less than £85,000. In which case the business does not need to join the scheme. In a case where a VAT registered business normally operates below the VAT threshold, but in one 12-month period temporarily exceeds the threshold due to unusual circumstances, then returns to operating below the threshold, they will need to register for the scheme. They must join at the beginning of the first VAT period starting after they exceeded the threshold and cannot withdraw in the future, even though the turnover will fall below the threshold again. 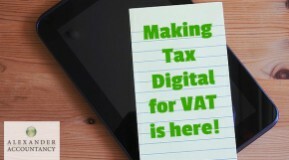 The only way of avoiding Making Tax Digital will be to deregister from VAT, which they will be entitled to do when taxable sales in the 12-months thereafter are expected to be less than the deregistration threshold of £83,000. If your own situation is unclear or confusing, we recommend talking to a tax agent such as Alexander Accountancy so we can point you in the right direction.